Toronto, Ontario--(Newsfile Corp. - January 24, 2019) - RosCan Gold Corporation (TSXV: ROS) ("RosCan" or the "Company") is pleased to announce the positive assay results from its initial Air Core drilling program at its Kandiole Project in Mali, West Africa. This drilling program was completed during December 2018 and was designed to test strong termite and soil gold anomalies (see September 21, 2018 press release). 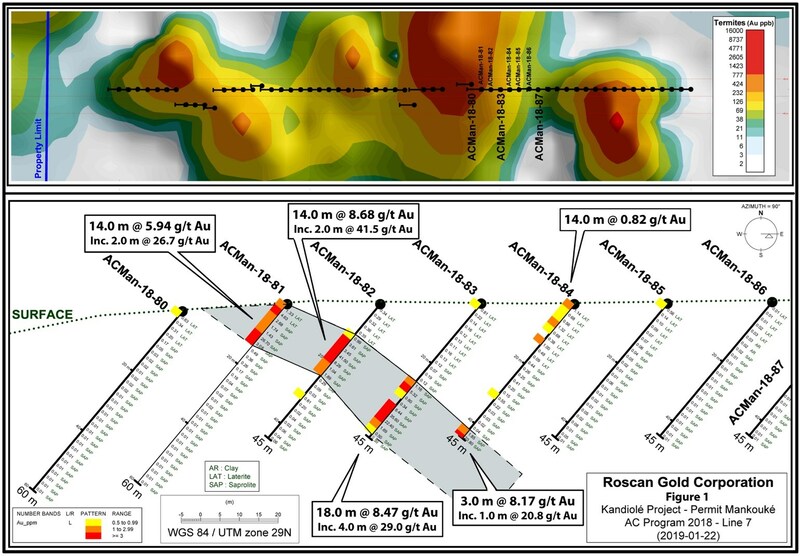 Significant amounts of saprolite-hosted gold mineralization was discovered in each of the two areas that were tested with the best results returned from the Mankouke area (see location map and cross-section). A summary of significant results is presented in Table 1. *True width could not be determined with the information available. Greg Isenor, President and CEO of RosCan Gold stated that "this is an excellent new discovery with very good gold grades. The mineralized zone is open to depth and appears, from a limited amount of drilling, to extend to the next drill line located approximately 250 metres to the north, and hopefully beyond, along this large geochemical anomaly. We are extremely pleased that our approach to exploration in this area has again been successful. Additional drilling is part of an obvious next step." This program is just starting, and we are encouraged by the indications that the apparent high-grade zone continues to depth. The air core drilling was completed over five anomalies that were tested with seven lines of AC holes drilled across the target areas generally in an east-west direction and drilled at -50 degrees to the west and to a depth of 45 to 60 metres in a heel to toe fashion. These anomalies were identified by a sampling program that had covered only 20% of the total land package. 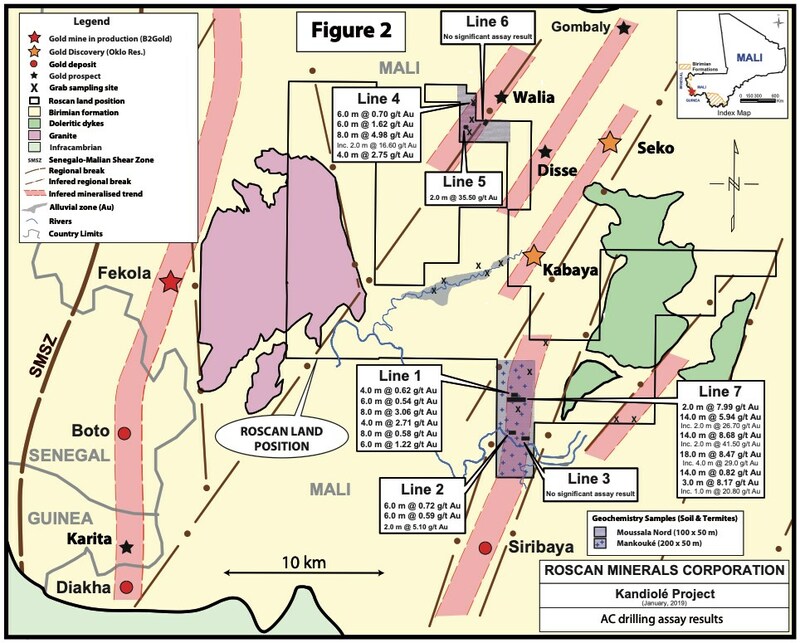 Significant gold mineralization was intersected in two areas, in first pass air core holes, at Mankouke on drill lines 1 and 7 and at Moussala North on drill line 4 (see Figure 1 for general locations). Air Core drilling is used to sample unconsolidated ground and compressed air is used to remove the cuttings from the hole. During the Kandiole drilling program samples of 2 metres were collected. For each 2 metre intersection a 2 kilo sample was collected and sent to the laboratory. A check sample of approximately 5 kilograms was collected for possible future tests. Further drilling will be carried out to test the extent of the mineralization at depth and along strike to the north and south of the strongly mineralized zones. Additional gold-in-termite and termite anomalies zones remain to be tested. The soil and termite sampling has identified anomalous trends that are consistent with the regional trends. In addition, new termite mound sampling has been carried out over a significant part of the property that has not been covered before; results are pending. The technical content in this news release has been reviewed and approved by Gregory P. Isenor, P. Geo, a Qualified Person as defined by NI 43-101. For quality control, duplicated samples were systematically collected in the field, and blank samples were inserted in the sample batches sent to the laboratory. A total of 63 blank samples and 62 duplicates were included in the sample batches sent to the lab. Before their transportation, the samples were stored in a RosCan secured location in the field. Batches of samples were transported by truck, driven by RosCan contractors, up to the sample preparation installations of Bureau Veritas laboratory at Bamako; prepared samples were then shipped by Bureau Veritas to their treatment installations at Abidjan, Ivory Coast. During the assay process, the laboratory applied its own quality controls with blanks, duplicates and standard samples. The assay method was atomic absorption (AA) with pre-concentration by fire assay (FA); the detection limit of the method is of 5 ppb. Note 1: this table includes all the mineralized intersections with a grade > 0.50 g/t Au; these intersections are considered as significant intersections. Note 2: intersections in bold refer to intersections with a grade > 0.50 g/t Au, and a length > 2.0. Note 3: true width could not be determined with the information available.